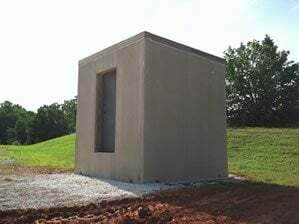 A concrete safe room stands ready for a home to be built around it. Superior Walls of East Tennessee in Rock Island, TN. Thirteen minutes. That’s all the time you have on average to seek shelter after a tornado warning is issued. If you’re at home when the warning comes, staying put will give you the best odds of survival. And those odds will increase substantially if you a have safe place in your home to ride out the storm. For people living in wood-frame homes without basements, that “safe” place often ends up being an interior room, such as a closet or bathroom, with no windows. But in a powerful tornado or hurricane packing winds of more than 250 miles per hour, even well-constructed frame houses can be lifted right off their foundations, and large debris can turn into airborne missiles. During such extreme conditions, one of the safest places you can be is in a room constructed of reinforced concrete or concrete block with no windows and a concrete floor or roof system overhead. That’s why more and more people, especially homeowners living in tornado-prone areas, are building concrete safe rooms in new and existing homes. When constructed according to approved plans, these windowless, heavily reinforced structures can withstand winds exceeding 250 mph and projectiles traveling at 100 mph or greater, protecting occupants from Mother Nature’s worst wrath. What Is the Cost of Installing a Safe Room? Costs for safe room construction vary across the United States. The cost for constructing an 8- by 8-foot safe room that can double as a closet, bathroom, or utility room inside a new home ranges from approximately $6,600 to $8,700 (in 2011 dollars), according to FEMA. A larger 14- by 14-foot safe room runs from about $12,000 to $14,300. The cost of retrofitting an existing home to add a safe room will vary with the size of the home and its construction type. In general, safe room costs for existing homes will be approximately 20% higher than those in new homes. See this safe room cost calculator from HighWindSafeRooms.org for average remodeling costs for 8- by 8-foot and 14- by 14-foot units made of concrete, concrete block and ICFs. Some communities offer incentives for owners who wish to build a safe room or shelter, including reduced property taxes. You may also be able to obtain FEMA funding to construct a safe room. For project eligibility, contact your State Hazard Mitigation Officer, who can advise you on what information to provide to be considered for funding. Some state and local governments have engaged in grant programs with the federal government to partially subsidize the construction of safe rooms.